I wouldn’t normally write a review of a book I’ve done with students in the course of my job – I’ve certainly never done it before. Most of the so-called novels read by kids studying English in Korea are abridged versions of classic literature and have little appeal to anyone. I’m still teaching some classes with books like that, but I also have the privilege of teaching a number of reading classes, two of which are doing Louis Sachar (pronounced ‘sacker’) books. 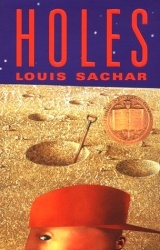 Holes is the story of Stanley Yelnats (whose name is the same backwards as forwards). He gets sent to a juvenile detention centre, Camp Green Lake, for a crime he didn’t commit (stealing the stinky secondhand shoes of a famous baseball player) where his past catches up with him. Not his own past, actually. His story doesn’t start with being sent to the dried up lake in the middle of the desert, nor does it start with being hit on the head with a pair of sneakers that fell off a bridge. It starts in the nineteenth century with Stanley’s no-good-pig-stealing-great-great-grandfather, Elya. A local gypsy woman, Madame Zeroni, helps him have a chance winning the hand in marriage of a young woman who’s just about to turn fifteen. Unfortunately, Elya forgets to honour his side of the bargain, so he and his descendants are cursed. Elya’s son, Stanley Yelnats (the present day hero of the novel is the fourth to bear that name) is robbed of all his money by an outlaw named Kissin’ Kate Barlow. She used to be a teacher in the town of Green Lake (in the days when there was a lake), but love turned to tragedy, which turned her to crime. I don’t want to seem like I’m giving away all the plot, but the interaction of the plot and the backstory is part of what makes Holes such a great novel. One of the vocabulary words I picked out for my students was ‘interwoven’, and that’s exactly how the book is. Everything is significant – location, names, history. It’s also very moving and honest, without being excessively brutal. It is fairly brutal in places – the warden paints her nails with varnish mixed with rattlesnake venom (and uses them), one of the camp counsellors gets smashed in the face with a spade (and deserves it). It’s also a story of redemption for Stanley and his family and for the friend he makes at Camp Green Lake. The only not so good thing about the book was the ending – it was cloyingly cheesy. That aside, this was an excellent book, winner of numerous deserved awards, and not just a book for kids.